Hi there lovely Crafters. 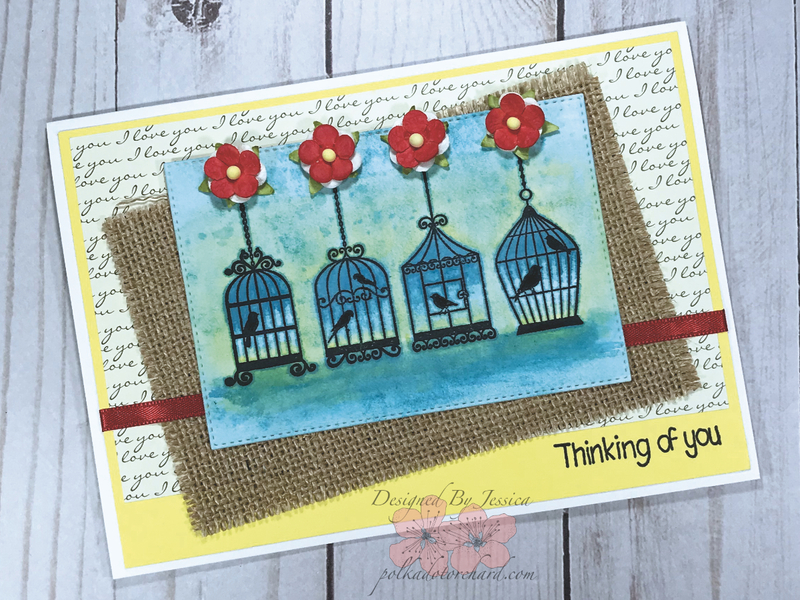 I’m here today with another card using the bird cages stamp from Victorian Originals. This was supposed to be an easy quick card. My original plan was just to throw some blue watercolor on to the bird cages, tie some little red bows at the top, then mounted to a card base with some burlap behind it, and finally finishing up with a simple sentiment. Well, it didn’t quite happen that way once I started going I didn’t stop. What should have been a 30 minute card took me about 3 hours. I do have to say I absolutely love how this came out, so it was worth every minute. The Victorian Originals Birdcage stamp was stamped on to Canson XL watercolor paper with Versafine Onyx Black Ink, Using my Tim Holtz Stamp Positioner. I then used my Derwent watercolor brush and Tim Holtz distress inks to watercolor my stamp image. So, attaching all the layers…. The cardstock and pattern paper were both attached using an atg tape gun. The burlap and watercolor paper were glue down with Ranger multi medium matte. I put a couple acrylic blocks on top to apply pressure while drying so they would hold together firmly. I did attach a piece of red ribbon that I had ran through my Xyron sticker maker before attaching my watercolor image. 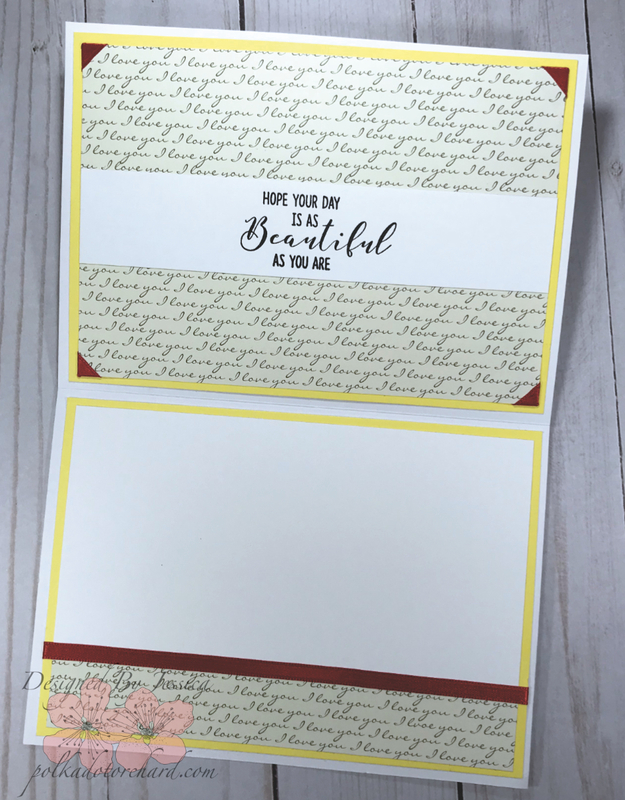 To finish up the front of the beautiful card I stamped the sentiment “Thinking of you” in Versafine Onyx Black Ink using my Misti stamping tool. This sentiment is from a Hampton Art “Coloring” stamp set. The last the best touch to this card are the beautiful red and white flowers from I Am Roses. These were glue down using Ranger multi medium matte. Now, of course I had to make the inside look pretty as well and I have to say, “it came out amazingly”. I used the same cardstock, pattern paper and ribbon that was used on the front, and they were attached with the same adhesive. To do the little photo corners I use the red ribbon, ran it through the Xyron sticker maker, and folded it around the corners. I always use the repositionable adhesive so I can remove it and adjust where needed. How lovely is that sentiment “HOPE YOUR DAY IS AS Beautiful AS YOU ARE”? Unity Stamp Co has some of the best sentiments and this one is from there 4/18 Kit Of The Month “Stay Classy” stamp. 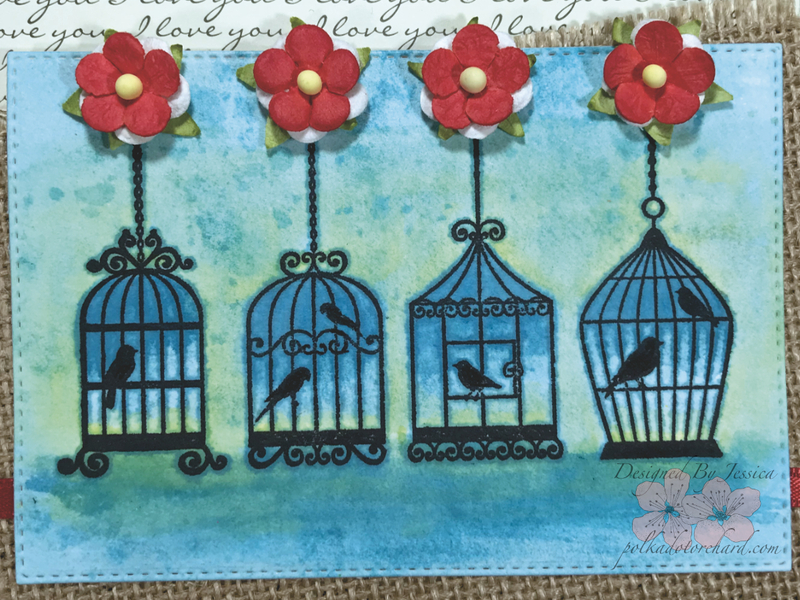 Beautiful use of the Birdcage stamps. So pretty in blue, layered on burlap and finished with the red flowers. Thanks for joining the SumMore Fun mood board challenge. This is so pretty! I have that stamp too and love seeing different ways to use it. Thanks for joining in the mood board challenge at vostamps.blogspot.com! Darling! Love the birdcages!! Thanks for joining us at I Am Roses! This is absolutely adorable!! 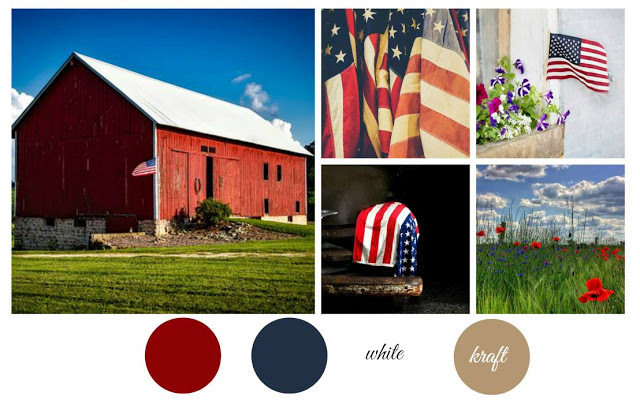 I love the layout, I love the burlap, I love the strip of red ribbon, I love it all!!! Thanks for joining us this week for the Simon Says Stamp Wednesday Challenge.